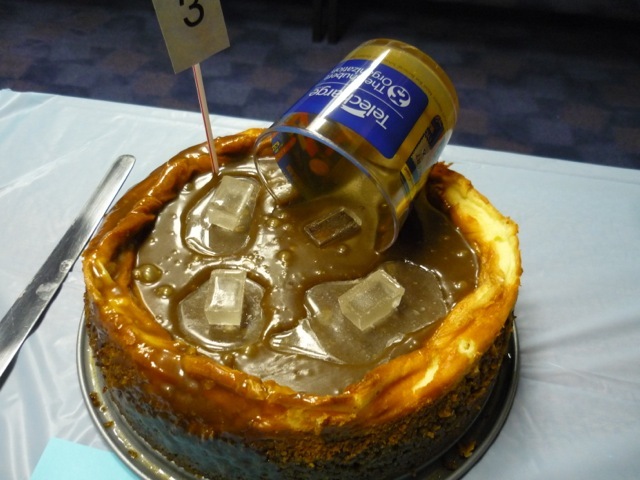 Our own Backstage Baker entered a cheesecake into the March 4 Cheesecake Bake-off too. His entry was a Walnut Crusted Caramel-Bourbon Cheesecake – an ode to George and Martha. The bourbon flavoring was so appropriate to the characters of “Who’s Afraid of Virginia Woolf.” And the presentation was as dramatic as they are! Pretty complicated, yes, but the result is smashing, no? 1. In small saucepan, combine brown sugar, whipping cream and butter. Bring to boil over medium-high heat; boil for 3 minutes. Remove 1/3 cup of the sauce; refrigerate until chilled. To remaining sauce add 2 tbsp. bourbon (or rum, if using); set aside. 2. Combine walnut pieces and 1/4 cup of the granulated sugar in food processor; pulse until it resembles coarse crumbs (do not overprocess). Transfer to medium bowl and stir in melted butter. 3. Using back of spoon press nut mixture into bottom and half-way up sides of 9-inch (23 cm) springform pan. Bake in 325 degree F (160 C) oven for 15 minutes. 4. Meanwhile, beat cream cheese with remaining 3/4 cup granulated sugar. Add eggs, one at a time, beating just until blended. Stir in 1/4 cup bourbon (or rum, if using). Pour cream cheese mixture into nut crust. Drizzle the 1/3 cup chilled sauce on top; gently swirl with knife. 5. Return cake to 325 degree F (160 C) oven; bake for 1 hour. Turn oven off; leave cheesecake in oven without opening door for another hour (prevents cake from cracking in center). Cool on wire rack; cover and refrigerate for 4 hours or overnight. 6. Just before serving, gently warm bourbon sauce; when not entering the cake in a contest I stir in toasted walnut halves. To serve, spoon sauce over slices of cheesecake.